How have they been aligned, enhanced, and improved? With the Insolvency Law Reform Act 2016 being introduced, there have been many amendments to both the Bankruptcy Act 1966 and Corporations Act 2001. Tranche 1 commenced on 1 March 2017. Tranche 2 commences on 1 September 2017. Remove unnecessary costs and increase efficiency in insolvency administrations. 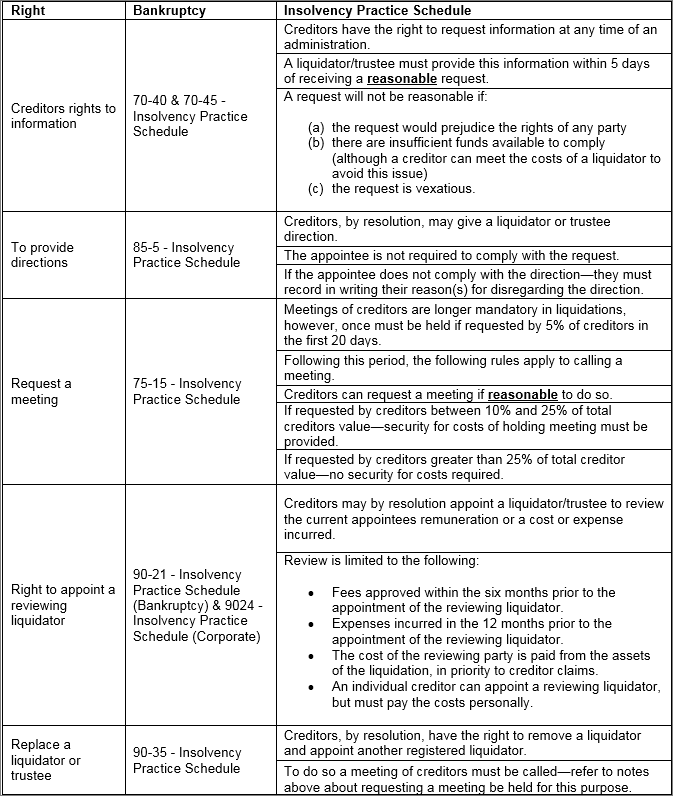 Align the registration and disciplinary frameworks that apply to registered liquidators and registered bankruptcy trustees. Align a range of specific rules relating how personal bankruptcies and corporate external administrations are handled. Enhance communication and transparency between stakeholders. Promote market competition on price and quality. Improve Australian Securities and Investments Commission's (ASIC) powers to regulate the corporate insolvency market and the ability for both regulators (Australian Financial Security Authority, AFSA, regulator for personal insolvency) to communicate regarding insolvency practitioners operating in both the personal and corporate insolvency markets. Improve overall consumer confidence in the professionalism and competence of insolvency practitioners. Some of those amendments included the increased rights of creditors in insolvency. The table below covers some of those creditor rights. A number of these powers have existed in personal insolvency appointment for some time�but they have now found their way to the Corporations Act. If you require any advice on these matters, please contact your local Worrells office. A bankruptcy trustee has several powers and options to claim against a typical family trust or otherwise recover funds. The statutory presumption of insolvency did not arise as there had not been effective service of a statutory demand. The administration period can be difficult for a landlord, as their rights in relation to the premises are restricted. This is practical guidance for external administrators in responding to information requests from creditors and others. Several proofs of debt were wrongly admitted or rejected; if correct, the company would not be put into liquidation.